After experiencing a state-wide faculty union strike in October, and its board of governors approving the new faculty union contract in December, the Pennsylvania State System of Higher Education (PASSHE) has now had public discussions on the possible merging or closure of select state universities. With a growing budget deficit and enrollment rates down at select universities, PASSHE’s Chancellor, Frank Brogan, addressed his board of governors and proposed a review that could potentially lead to some form of merging or closures within the 14 state universities under PASSHE’s jurisdiction. “Many of our universities are feeling the twin effects of declining revenues and enrollments. As daunting as those challenges have been, there is little doubt that 2017 will bring new and perhaps even greater challenges. In fact, I believe this year will be pivotal for the State System,” said Brogan. Brogan also elaborated on a few of the challenges PASSHE schools may be facing in the near future. No university has been singled out for the merging or closure process as of yet. Local state system universities include California University, Clarion University, Indiana University, Slippery Rock University, and Edinboro University. 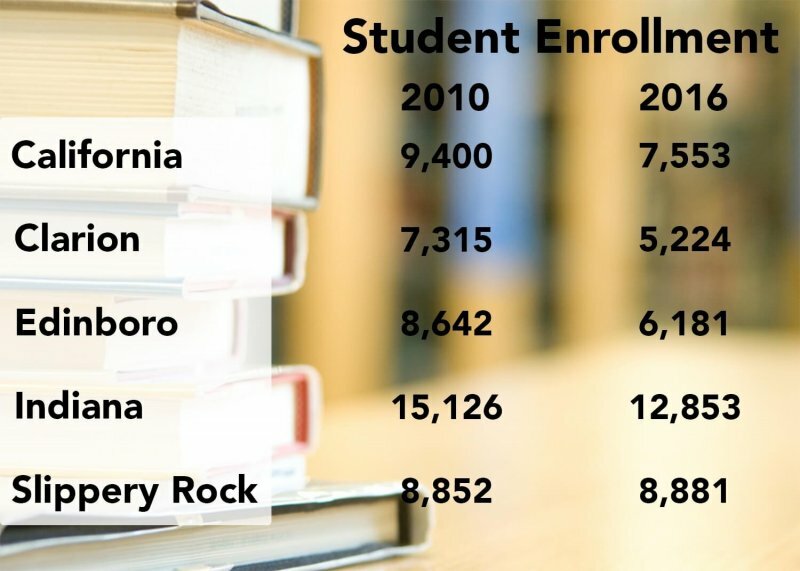 In the past six years, California University’s enrollment rate has reduced by nearly 1,900 students; Clarion University, 2,100 students; Edinboro University, 2,500 students; Indiana University, 2,300; with Slippery Rock University’s population steadily increasing. “We cannot just tinker around the edges; we’ve got to be brave enough to explore every option as we move forward,” said Brogan. PASSHE has not made official decisions regarding the merging or closure of any state universities. Check next week’s issue of The Spectator and edinboronow.com for an extensive interview with Edinboro University’s President Fred H. Walker, regarding potential changes for Edinboro.